The 8th annual Melbourne Underground Film Festival is still on for this coming Sept. 20-30. The entry period is now closed, but the fest has adopted an official theme. Festivals have themes? This one does and it is “A Benevolent Psychopathology”! Not sure what that means, but those interested are encouraged to read J.G. Ballard. I’ve seen Crash (creepy Cronenberg version) a couple times. Does that count? Also just announced: This year’s international guest will be Peter “Sleazy” Christopherson, a musician known for his associations with pioneering industrial outfits like Throbbing Gristle, Psychic TV and Coil. Sleazy has also directed videos for his bands and for others, like Nine Inch Nails, Van Halen, Hanson and Barry Gibb (of course I picked the most bizarre ones out of his entire filmography). As I’m not really familiar with his work, I’ll embed a Coil video I found below for the song “The Wheel.” Oh yeah, Sleazy will also be playing with his new band at MUFF, the Threshold House Boys Choir. MUFF will also be hosting (at least) two retrospectives: One of Larry Wessell, curated by Jack Sargeant; and the other Donald Cammel, curated by Jon Hewitt. And, in bigger news, MUFF has teamed up with Accent Entertainment for a special line of DVD releases of past MUFF hits. The first three films will be out this Nov. They are: demonsamongus, dir. Stuart Simpson: The Actress, dir. Zak Hilditch and Punishment Park, dir. Peter Watkins. Since many underground films never see the light of day beyond their festival rounds, this is a monumentous accomplishment for the fest and these great filmmakers. Well, I haven’t seen the films, but if MUFF is endorsing them, they’re great. Period. Finally, it wouldn’t be a MUFF news event if fest director Richard Wolstencroft wasn’t airing some beef. Here we go: If you haven’t heard, the first ever Sydney Underground Film Festival will also be running in Sept., which is founded by filmmaker Stefan Popescu, who won the Best Director award at MUFF last year. Hey, that’s all good, right? Two underground fests. The more the merrier, right? Not exactly, Wolstencroft is now saying that he specifically pitched Popescu the idea of starting a SNUFF fest together, i.e. 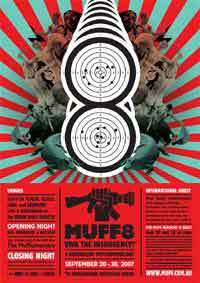 a Sydney/Newcastle Underground Film Festival, at the 2006 MUFF. Wolstencroft further states that Popescu claimed he would register a SNUFF business name and get back to Wolstencroft. However, after months going by, there’s no word about SNUFF, but the first ever SUFF is announced — an announcement that gives no credit whatsoever to Wolstencroft pitching the idea in the first place. SUFF’s About page mentions none of this history about the formation of the fest, nor is there any shoutout to Wolstencroft or MUFF at all on the site. Hey, I don’t know what went down, but Wolstencroft wants to get this all out in the open and see what Popescu has to say about the matter. Did Wolstencroft pitch the idea first? Or what exactly did the two talk about at the 2006 MUFF regarding a SUFF? If Popescu wants to respond here on the Underground Film Journal, I’d be thrilled to run his thoughts. Stefan?